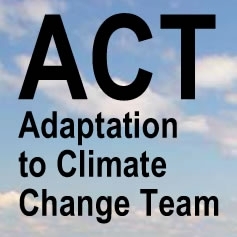 ACT is a policy planning initiative from Simon Fraser University designed to develop timely options for sustainable adaptation to climate change impacts. Climate change is here, bringing unprecedented challenges, but also new opportunities. It is vital that we equip decision-makers with resources that will assist industry, governments, and communities to adapt to the impacts. SFU has formed ACT in response to this need. ACT studies nine top-of-mind climate change areas (Biodiversity, Extreme Weather, Energy, Water Security, Crops & Food Supply, Sea Level Rise, Health Risks, Population Displacement, and New Technologies) and considers ways to protect environmental, economic and social well being throughout its five-year program. Working in conjunction with leading experts supported by the expertise of SFU researchers and faculty, ACT studies the problems posed as well as potential solutions, and identifies policy opportunities while developing adaptation resources. ACT’s advisers include experts such as leading environmental economist Dr. Nancy Olewiler, former provincial Deputy Minister of Sustainable Resource Management Jon O’Riordan, and adaptation science expert Dr. Stewart Cohen. ACT’s findings have stimulated new policymaking and research as well as widespread public interest — the program has received national media attention including presence in Canadian Business magazine. Climate change is the challenge of a lifetime – it’s time to ACT!